Above is the 6-month daily chart for Almost Family (AFAM). Pretty much immediately after entering the position, this stock went from about 40, to hovering just above 30. I originally shorted five February 30 Puts for .85 (that’s $85 per contract). With the nose-dive, the value of those puts rose significantly, touching as high as $2.50 a couple weeks ago. In all honestly, I should have gotten out of the trade once the options doubled up on me, but nothing about the move seem justified. I’ve been down this path already, but for new readers out there, you can catch up on my inexperienced trading psychology now… $AFAM has been a solid equity for the past few months, even when others were tanking rather significantly last quarter. Then, to have the bottom fall out on this health care based stock didn’t seem right. So far, my conviction has stayed correct. 30 has turned out to be at least a decent support level for this stock, being a unit of 10, and as 40 was also previous support and resistance. At this point, I will be quite pleased with shares holding above that mark through Friday. I’ll likely be ready to move on and forgo another month with AFAM. Ideally, it can close above it’s MA(20), which has not happened since last year, in order to give it a little staying power for the remainder of the week. 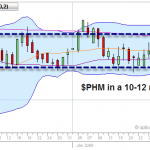 PHM in a range. Click to enlarge. Pulte Homes (PHM), has been a little less turbulent the past month. From the chart, we can actually see it’s been in a 10-12 range since the beginning of December. That’s actually perfect for a stock that I was able to sell February 10 Puts on for $1.00 to open my position. The only thing with a stock like this being in such a tight range for so long is that it’s really just building up for a burst in one direction or the other. I imagine some of this will hinge on the outcome of the stimulus package 2.0 which could get put in place by the end of the week. That’s going to make the market very interesting in general, but I imagine it will be even more so for a major home builder. Despite the turbulence, I believe I’ll still plan on holding at least $PHM through expiration, regardless. The shares are inexpensive enough, and if I should get the puts exercised on me, I’ll be getting them at 10% discount due to the premium I’ve already collected. It will be an interesting experience to deal with owning some of these shares if that should happen. I already have a game plan ready, but we’ll worry about the details if and when it comes to that. Almost Family will be a different situation. If the 30-mark starts to get threatened in the next few days, I’ll have to be ready to take action. I’m not really up for getting exercised on 500 shares at $30. I could make it work, but it would by no means be an ideal situation for me and the current size of my options trading account. That’s a little to big-time for me at this point. So, stay posted here for updates. I’m also going to put together a research post or two this week to get ready for March expiration. Happy trading! This entry was posted on Monday, February 16th, 2009 at 10:24 pm	and is filed under Position Update, Short Puts. You can follow any responses to this entry through the RSS 2.0 feed. You can leave a response, or trackback from your own site.